'Nominee' (Mary Dunn, R. 1995). Seedling# M1062A. TB, 36" (91 cm), Midseason bloom. Standards rosy tan; style arms copper; falls cordovan fancy pattern, slight markings at tip of golden beard; ruffled. 'Freestyle' X Hamblen seedling# 82-42B. 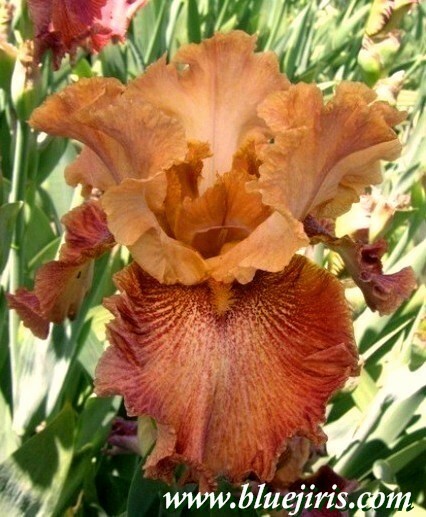 MAD Iris 1997. From AIS Bulletin #305 April 1997 Introducing NOMINEE (M. Dunn) (Freestyle X Melba Hamblen's 82-42-B) This is my pet! I was so fond of Hamblen's lines, and I have one like them of my own with very ruffled chamoisstandards. Falls are rich rosy cordovan, fancy bicolor pattern. Copper styles & beard. Ruffled, showy, branched, and many flowers. M1062A. $40.00. M.A.D. Iris Garden.